VeggieTales are welcomed in our home. These DVDs are fun, family friendly and teaches life lessons that are so easy to understand by little ones. And adults :). The VeggieTales: Pistachio - The Little Boy That Wouldn't, showed up in my mail a few weeks ago, but I thought it was an error and didn't open it, thinking I might need to return it! Turns out it was definitely ours! My children are young, but still understands most of what's happening on screen with the characters and they want to watch this over and again! I love this DVD as it does have a wonderful message for everyone in the family. If you watch VeggieTales, then you need to get this one and if you don't yet, then this would be a wonderful way to begin introducing VeggieTales to your family. We do own a few VeggieTales but mostly borrow from the library. So if you don't feel you want to purchase just yet, then check out your local library. 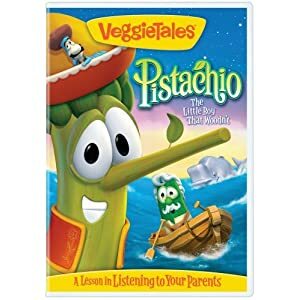 Big Idea, Inc. presents an all-new family adventure featuring a helpful lesson in listening to your parents with VeggieTales®: Pistachio – The Little Boy That Woodn’t. In this creative parody of the beloved story of Pinocchio, VeggieTales follows its unique tradition of retelling classic adventures like Lord of the Beans, Wizard of Ha’s and Minnesota Cuke! The DVD, priced at $14.99 SRP, includes the brand new Silly Song, “Where Have All The Staplers Gone,” and lots of family friendly bonus features. Supported by a comprehensive advertising and marketing campaign, Pistachio comes to DVD in stores February 27 and March 2, 2010 in Christian and general market stores respectively. Once upon a time in the small town of Bologna-Salami , there lived a lonely toymaker named Gelato and his assistant Cricket. Gelato had no children of his own, so one day he decided to carve a little boy out of wood. Imagine Gelato’s surprise when he learned this little boy could walk…and talk…and definitely had a mind of his own! When Pistachio tries to do things his way, he lands in a “whale” of a situation! Will he decide to listen to the wisdom of a loving father in time to save his whole family from becoming fish food? Find out in this all-new adventure with a lesson about the importance of family and learning to listen. Long-time promotional partner Chick-fil-A, Inc. will partner with VeggieTales in a national promotion at their 1400+ restaurant locations with more than three million kids meal bags, five different enhanced VeggieTales CD premiums with videos, music and activities, coupons for $2 off the Pistachio DVD and in-store signage. Additionally, Chick-fil-A will host VeggieTales Family Night parties in more than 400 restaurant locations that will include activity posters, stickers, balloons, prizes and more. This is one of the largest VeggieTales promotions in the multi-year relationship. "We are always thrilled to partner with VeggieTales," says Angela Savage, Chick-fil-A Senior Consultant, Family Marketing. "Chick-fil-A wants to have a positive influence on all of our customers, particularly our youngest patrons, and the opportunity to serve families through this strategic partnership with Big Idea’s VeggieTales is a great one." VeggieTales will also launch its first-ever branded kids grocery carts in more than 500 locations including Kroger and other major chains in January 2010. Each “TVKart” will feature a video screen with selection button for children to watch VeggieTales silly songs, clips and promotions for upcoming DVD releases including Pistachio. In partnership with new licensee, Frankford Candy & Chocolate Company, cross-promotional mention of the Pistachio DVD will appear on packaging of more than two million units of VeggieTales branded Easter themed candies sold through mass market retail beginning in February. Furthermore, the music video for the new silly song, “Where Have All The Staplers Gone?” featured on Pistachio, will play in Chuck E. Cheese’s family restaurants’ 529 locations, as well as at Gymboree children’s clothing stores’ 761 locations and Crazy 8 stores’ 53 locations during the first quarter. The total promotional partnership campaign will reach more than 44 million impressions. Atlanta-based Chick-fil-A, Inc. is the nation’s second-largest quick-service chicken restaurant chain (based on sales), currently with more than 1,470 restaurants in 38 states and Washington, D.C. Chick-fil-A produced record sales in 2008 of $2.96 billion – a 12.17 percent overall increase and an 4.59 percent same-store sales gain that helped extend the chain’s streak of consecutive sales gains to 41 years. More information about Chick-fil-A is available on the chain’s websites, located at www.chick-fil-a.com, www.chick-fil-apressroom.com, www.truettcathy.com, www.facebook.com/chick-fil-a and www.twitter.com/chick_fil_a. Big Idea, Inc. is the leading faith-based studio and producer of children’s and family programming, characters and brands. For more information on Big Idea, visit: www.bigidea.com. I received a DVD for this review, but it in no way influenced my review as we have always loved VeggieTales! My kids loved Veggie Tales for years. I only recently got the idea what it was about. You're right, it teaches great lessons. Ill have to tell my friend. Her son is a Veggie Tale maniac.